Sam Gabrielli, bar manager and “mixologist-extraordinaire,” at Russell House Tavern in Cambridge, recently concocted some new cocktail creations that could be described as magically delicious. 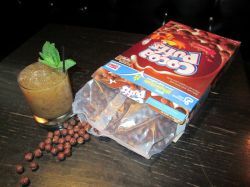 The cereal-infused brunch cocktails are certainly something that you won’t see every day. Drinks like the Cinnamon Toast Mudslide and the Cocoa Puff Smash have raised more than a few eyebrows around town. “Curiosity catches the attention, and the full-bodied flavors keep them coming back from more,” Gabrielli says. Muddle lemon and mint in a pint glass. Add booze and shake with ice. Double strain into crushed-ice-filled double old-fashioned glass. Garnish elaborately with pretty mint sprig. Laugh Boston: "This isn't the Field of Dreams. This Is Comedy."